Hobby Horsing is a popular sport that originated in 2004 in Finland and is currently growing in popularity throughout Europe. 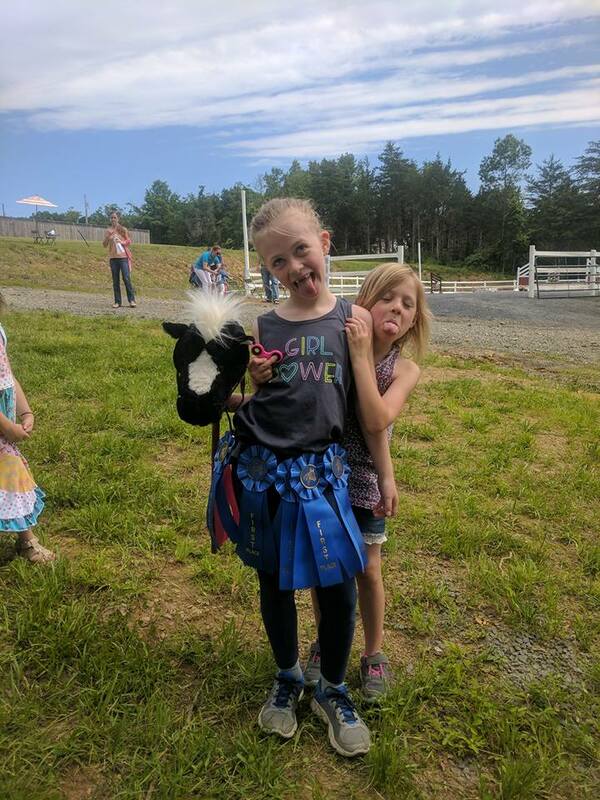 White Oak Stables is proud to present the first Hobby Horse Shows in Northern VA! Racing Sprinters – Is designed to test the maximum speed of the horse and rider. A sprint is always one lap around the designated arena course. Riders that go outside the arena course boundaries or exceed the maximum time limit are disqualified. There are no obstacles to jump over in this division. Racing Pacers – Is designed to test both the speed and endurance of the horse and rider. A pace is always two laps around the designated arena course. Riders that go outside the arena course boundaries or exceed the maximum time limit are disqualified. There are no obstacles to jump over in this division. Racing Distancers – Is designed to test the endurance of the horse and rider. A distance race is always three laps around the designated arena course. Riders that go outside the arena course boundaries or exceed the maximum time limit are disqualified. There are no obstacles to jump over in this division. Racing Fun – are designed to be fun and entertaining and test a rider’s skill in unusual situations. These range from one to three laps around the arena and potentially interacting with various obstacles. There are no obstacles to jump over in this division. Racing Teams – are designed to be fun and entertaining and test a rider’s coordination, cooperation and communication skills in unusual situations while working with a team mate. There can be as many as four riders to a team but a minimum of two riders is required. These range from one to three laps around the arena and potentially interacting with various obstacles. There are no obstacles to jump over in this division. Racing Steeplechase – Is designed to test the speed, endurance and jumping ability of horse and riders. A steeplechase consists of at least 4 jump, but may have as many as 25 jumps. Maximum jump heights are determined by the age of the youngest competitor. Racing Steeplechase Fun – are designed to be fun and entertaining and test a rider’s skill in unusual situations. These range from one to three laps around the arena and potentially interacting with various obstacles. There are at least 4 jump obstacles, but there may be as many as 25. Maximum jump heights are determined by the age of the youngest competitor. 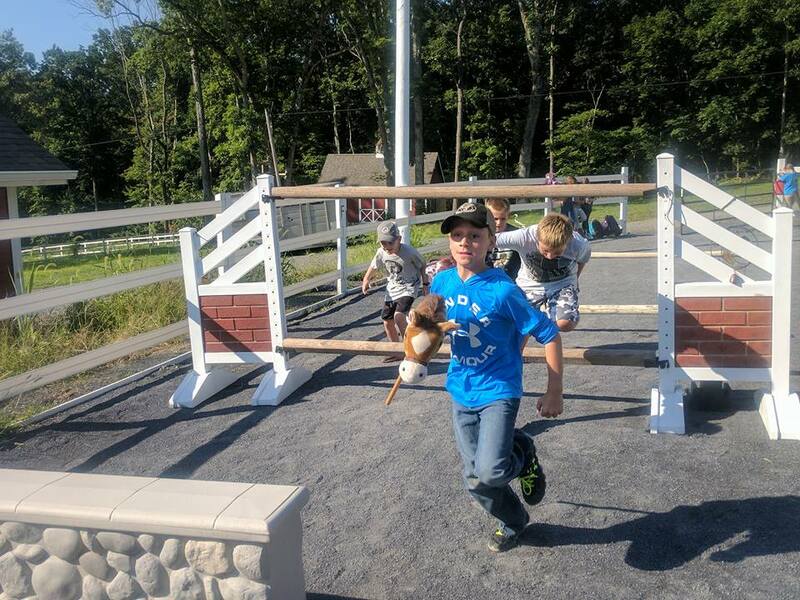 Racing Steeplechase Teams – are designed to be fun and entertaining and test a rider’s coordination, cooperation and communication skills in unusual situations while working with a team mate. There can be as many as four riders to a team but a minimum of two riders is required. These range from one to three laps around the arena and potentially interacting with various obstacles. There are at least 4 jump obstacles, but there may be as many as 25. Maximum jump heights are determined by the age of the youngest competitor. Pleasure – Judges how pleasurably the horse and rider pair go around the arena at different gaits. Takes into account gait consistency, transitions, impulse, energy, style, appearance of the hobby horse, tack, turn out, proper use of aids and turn out. Hunter/Jumper – Tests the ability of horse and rider to complete a course of obstacles. Follows the same guidelines for judging as the Pleasure addition, also taking into account the style, approach and jumping ability of the horse and rider. 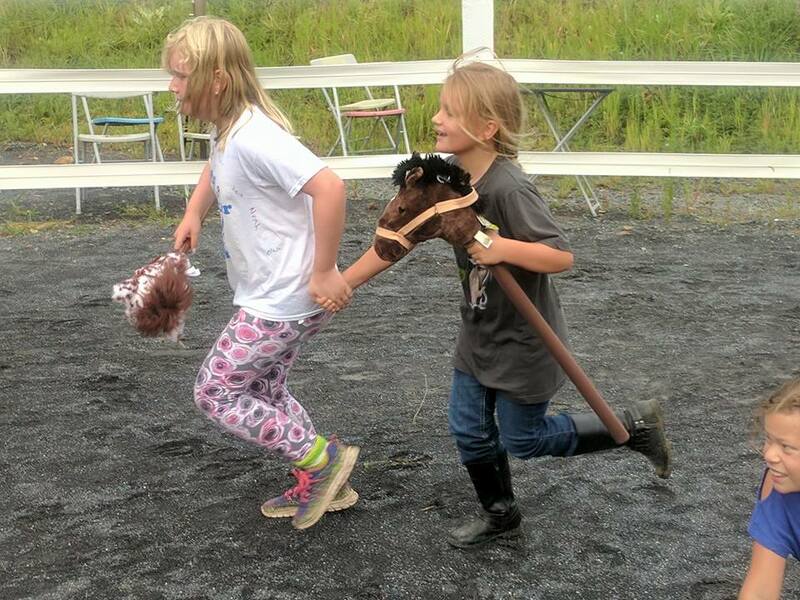 All competitors must have a hobby horse/stick horse and be mounted as they compete. We recommend shorter sticks for competitors planning to jump. Classes must have at least 3 entries to be judged. Ribbons will be awarded for each class up to 6th place. Shoes are required for all competitors. Show attire or schooling attire are not required but encouraged. Riding helmets are not required but strongly encouraged for jumping classes. Mini classes are open to any competitor aged 7 or under. Junior classes are open to any competitor 8 to 14. Competitors will be disqualified or excused from their class for dismounting, exceeding the time allowed, excessive jumping faults, being off course, refusals, being disrespectful to fellow competitors, hitting/kicking or using their hobby horse in any way other than how it is intended. No horses, dogs or trailers will be permitted on the show grounds. Hobby horses only! No drugs, alcohol, or glass containers are permitted on the show grounds. The judge reserves the right to split and combine classes or divisions due to the number of entries. All competition rulings and judge results are final.